3D authoring tool for creating games, 3D apps, and websites. Is there a better alternative to CopperCube? Is CopperCube really the best app in Author Tools category? Will CopperCube work good on macOS 10.13.4? 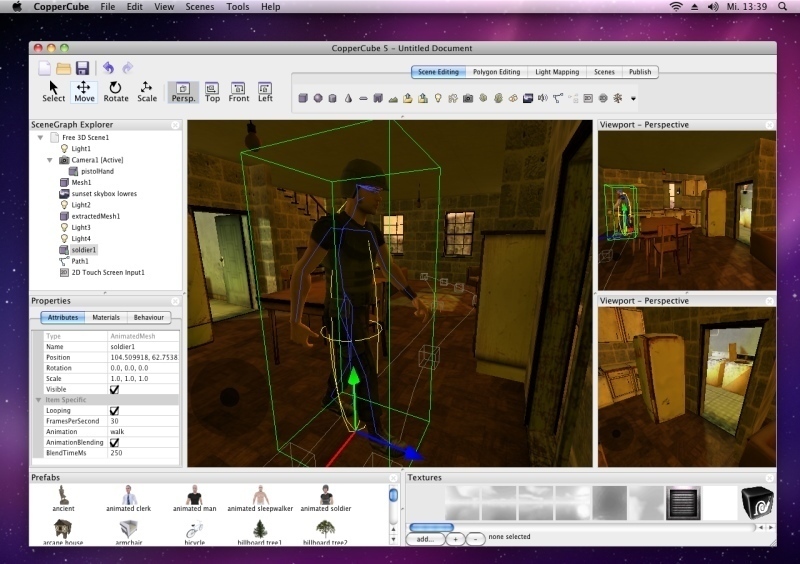 CopperCube is a 3D authoring tool - create 3D websites, apps and games without programming. It creates Mac OS X and Windows apps, WebGL and Flash websites and Android apps. 3D games created with CopperCube also run on iOS 8 via WebGL. You don't have any programming skills for this, you can click your apps and games together from existing actions and behaviors. But it also offers a scripting interface for advanced users. It supports everything from terrain, particle systems, character animation, effects, physics, video playback, network communication, iOS 8 (via WebGL), shader programming, animation blending, and more. Note: While Finder will indicate that the app is at version 5.3, the developer refers to this version as 5.7. CopperCube can now draw dynamic shadows, by using shadow maps. CopperCube needs a review. Be the first to review this app and get the discussion started! CopperCube needs a rating. Be the first to rate this app and get the discussion started! This works nicely for outdoor scenes: Put a directional light into your scene and activate the "realtime shadows" checkbox of the root scene object. You can have both static lighting (light maps), dynamic lighting (shadow maps) and no lighting (white) for objects in the same scene. It is possible to select manually which object should cast shadows and which should not. There are also a few parameters which can influence the look of this. There is a new tutorial showing how all this works. If your game uses a lot of data like textures / sounds / scenes etc, CopperCube now makes it easy to do this as well: You can now dynamically load levels and scenes at runtime. There is now a scripting function named 'ccbSwitchToCCBFile()', which when invoked will wipe the memory and load/start that new file. This makes it possible to split your game up easily into multiple files. Works for Windows .exe and MacOS apps. If you are using a newer Android SDK, your CopperCube generated Android game can be uploaded again directly to the store without the need to manually zip-align it. Background: Google moved the zipalign tool location in newer SDKs to another location. CopperCube now detects this. Additionally, CopperCube is now also compatible with Android Studio. The editor will now detect missing installed DirectX runtimes and provide a download link to install them. You can now save textures to disk using the new scripting function ccbSaveTexture(). This is for example useful when using the built-in 3d model texture packer, and you want to export the model or texture. You can also save textures directly in the editor by right-clicking the texture and choosing "save as...". The default Android update mode is now 'every frame' instead of 'when scene changed', resulting in a more smooth gameplay. Also, this will reduce the 'stuttering' which some people noticed on faster Android devices. Windows .exe Apps no longer store their variables in the "CopperCubeApp" folder in the registry, but in a folder named after the application name. Fixed a problem when using the "Restart scene" action which caused memory to leak. Resetting a behavior now using the "Reset" action causes the FPS camera and keyboard controlled camera also to reset their keyboard states.